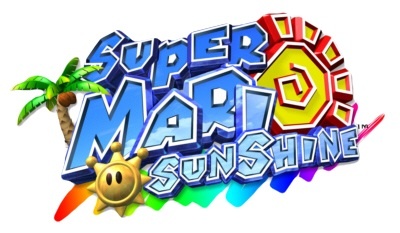 Super Mario Sunshine, developed by Nintendo Entertainment Analysis and Development and published by Nintendo for the GameCube. It was released in October 2002 across Europe. It is the second 3D Mario platformer, following Super Mario 64. 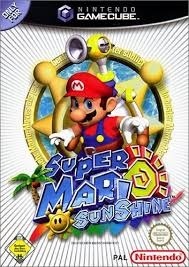 The game takes place on the tropical Isle Delfino, where Mario, Princess Peach and five Toads are taking a vacation. A villain resembling Mario, known as Shadow Mario, vandalises the entire island with graffiti and Mario gets blamed for the mess. Later on, Mario is ordered to clean up Isle Delfino, while saving Princess Peach from Shadow Mario. Mario cleans up the island with a device called Flash Liquidizer Ultra Dousing Device or FLUDD for short. When Mario first acquires FLUDD he can spray and hover using its nozzles, it can be upgraded later in the game to extend functionality. The rocket nozzle, which blasts Mario up high into the air and the turbo nozzle, which lets Mario sprint at high speed on land and water and break down specific doors. Mario can also ride Yoshi later in the game, who can eat fruit and squirt the juice of that fruit. This juice can be used to dissolve orange generators acting as obstacles, and briefly transform enemies into platforms for Mario to step on. The color of Yoshi and color of its juice depends on the type of fruit last eaten. There are 240 blue coins and 120 Shine Sprites. Each level consists of eight tasks, which may be played again at will once they are completed. Once the player has collected enough Shine Sprites, a new level is available at Delfino Plaza, either by the acquisition of a new ability or a plot-related event. Of the 120 Shine Sprites, 24 are gained by collecting and trading Blue Coins at a rate of 10 coins per sprite. Gameplay proceeds in this fashion until all of the Shadow Mario-related missions are completed, which unlocks the level containing the final boss. Check out this crazy tv spot! Eternal Darkness is a survival horror video game released for the GameCube. Developed by Silicon Knights and originally planned for the Nintendo 64, it was released November 2002 in Europe. It was the first video game published directly by Nintendo to be rated M for mature by the software rating board. Eternal Darkness’ plot revolves around Alexandra Roivas, who is investigating the mysterious murder of her grandfather Edward Roivas. While exploring his Rhode Island mansion, she discovers a secret room containing, among other odd items, a book bound with human skin and bone. When she reads this book, The Tome of Eternal Darkness, she experiences a scene in the life of Pious Augustus, a respected Roman military commander in 26 BC. Pious is led by mysterious voices to an underground temple, where he chooses one of three mysterious artifacts. The artifact transforms him into an undead warlock, the Liche, and makes him slave to one of three Ancients, powerful godlike beings whose Essences are incarnated as the artifacts. As the plot unfolds, it becomes clear that Pious is attempting to summon his Ancient into this reality, while the powerful fourth “Corpse God” Mantorok is bound on Earth already, apparently helpless to stop it. If this summoning came to pass, the Ancient would feast on the bodies and souls of all living beings, and cast the universe into the horror of eternal darkness. The game utilises sanity effects to enhance the gameplay. 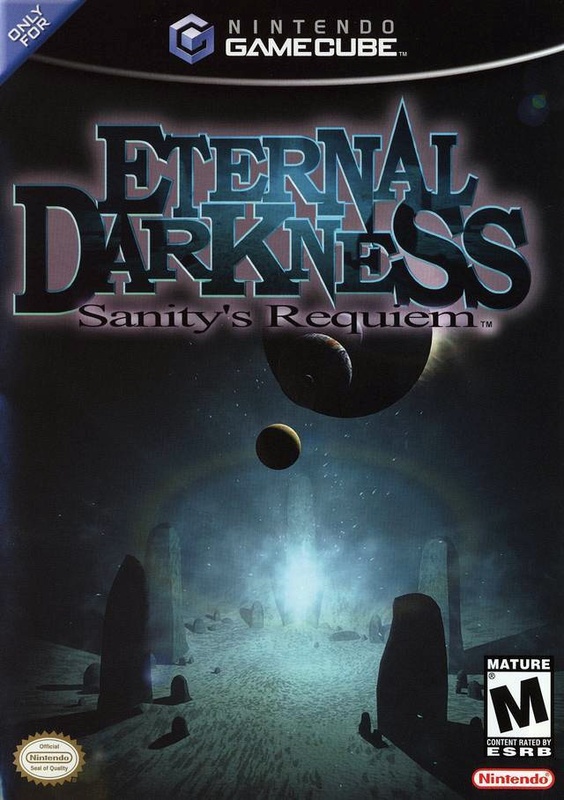 Though not a commercial success, Eternal Darkness was widely praised, winning the Outstanding Achievement in Character or Story Development award at the Annual Interactive Achievement Awards long with numerous other awards.